Buy Clublaptop Apple MacBook Air 13.3 inch MC966LL/A Macbook Case online - Clublaptop - The largest online store by Manufacturer of Laptop Accessories and Spares. Clublaptop MacBook case is a smart edge to edge attractive and protective cover for your MacBook. 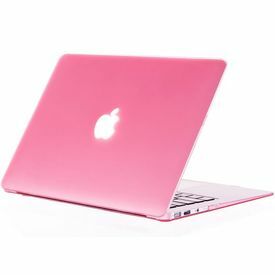 Available in range of colors, it gives your MacBook a very rich and classy feel with its semi- translucent frosted looks. Its Smooth Rubberized like finish not only adds to your MacBook’s look but also creates a great grip to hold on your laptop. Your most precious MacBook’s logo pops out of the frosted case when lit to create the unique look for your device. Designed ergonomically this case allows you to access your laptop’s all ports with no interference at all. Made out of very high quality poly-carbonate Clublaptop MacBook Cases are very light in weight and strong in strength. Available in 2 pieces for top and bottom, these cases gives your MacBook the best in class protection from accidental damage, dust, bumps and scratches. Now!! Carry your Apple MacBook anywhere and work, play or flaunt your MacBook without worries of getting scratches or damages. Features Protects Accidental Damage, Waterproof & Dust Resistance and Scratch Resistance. Please Note: * Apple MacBook is registered trademark of Apple, Inc. These products are Apple compatible and not endorsed by Apple, Inc*. The image is for representational purpose only. Actual color & shade may vary. There is no apple logo cut on this Clublaptop MacBook case. Logo is visible only when lit. These cases are not universal and is designed model wise. Kindly cross check your model from the product title before placing the order.